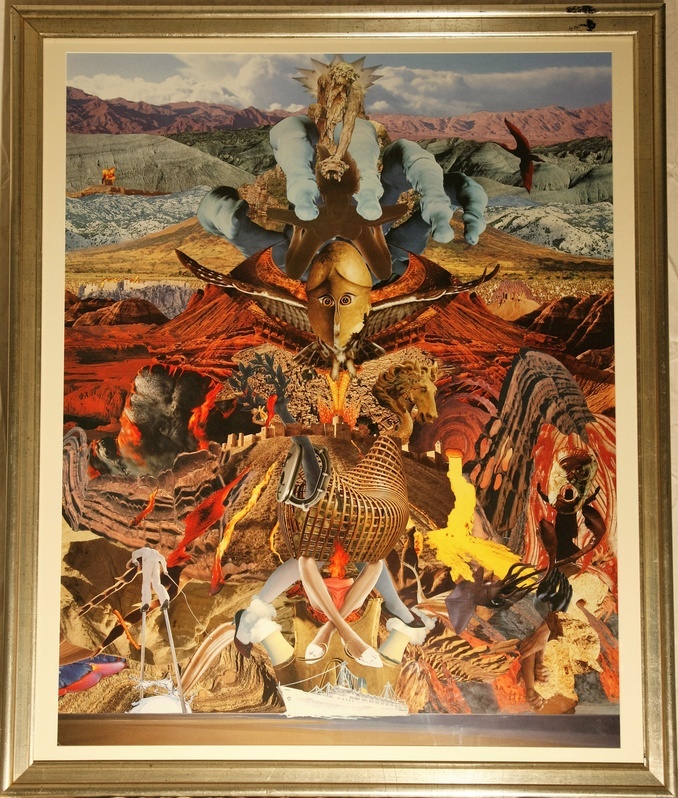 (80cm x 100cm / 32" x 40") This collage captures the Fall of Troy. It is dominated by images of power, war and fury, containment and escape, doom and relief. Zeus, on high, above an ominous Hand of Doom, drops his naked daughter, Helen of Sparta, splayed onto the Greek helmeted owl of Athena soaring over Troy. The wings of the owl blend into the composite pieces of an upside down Eiffel Tower that plunges into the flames of ancient Troy. The mountain upon which Troy sits blends into an ominous dragon landscape. Camouflaged armed GIs hide within the belly of The Trojan Horse atop seductive ladies' legs. From the trap door emerges an arm raising a victor's wreath within and above the Walls of Troy. A dragon head blends with the horse's mane. Its menacing emergence reveals the true character of the seemingly benign gift of the horse. In the lower right, a giant squid, propelled from the sea, captures and devours Laocoon, who warned of the peril to come if the Horse were to enter the Gates of Troy. The Greek liner at the bottom returns home. To the left, Ulysses on stilts, will have tall tales to tell when he reaches his Ithacan home.